As a Motorpass cardholder you enjoy many benefits designed to save you time and money! Lube Mobile are now making servicing & maintaining your fleet vehicles simple and easy too! Forget the downtime of staff having to take the morning / afternoon off work to drop the car off at the local workshop or dealer - we come to them! Home or office, we come equipped with all the tools of the trade to complete all types of maintenance work on a vast range of fleet vehicles. Motorpass cardholders also enjoy a special discount of 7% off all work completed. Simple, easy & affordable - the way car servicing should be! Call us today on 13 30 32 and simply mention 'Motorpass' to receive your special discount. We will have a mechanic on his way at a time and place that is convenient for you! Click here to download our Motorpass Partner Offer PDF or visit the Motorpass official website. - Operate fleet efficiently & reduce downtime: We can work on the vehicles at your office / workplace, there is no need to take the cars anywhere else or worry about staff downtime. We are flexible and efficient – resulting in less stress, worry and burden for you! - Stay in control of costs: We provide a fixed price for all car services as well as a written quote prior to any repairs commencing on your vehicle. We also prioritise the repair quote so you know what is more important and needs doing first. - New cars under manufacturer’s warranty? No problem! We can service your vehicles according to the manufacturers log book specifications and stamp your log book as a record of the service taking place. - Nationwide warranty: All work is carried out by experienced and highly qualified technicians using the latest equipment. For added peace of mind, all work is also covered by our 12 month / 20,000km nationwide warranty! 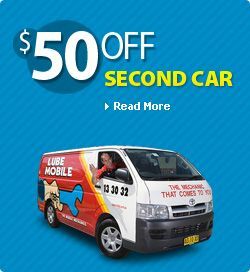 - Friendly, personalised and professional customer care: Lube Mobile has been servicing Australian customers for over 30 years. We have a dedicated Australian based Customer Care team (as well as dedicated Fleet Specialists) ready to address any concerns or queries you may have along the way! - Service reminders and scheduling: As we all know preventative maintenance is a must so your dedicated mechanic will conduct methodical inspections of your fleet and set up a reminder system so you know exactly when and what is required on each vehicle. - Servicing & repair history: At Lube Mobile we keep a database of all past repairs and services completed on each vehicle ensuring that work is not duplicated or carried out unnecessarily. - Proactive approach to maintenance: Our qualified technicians can make recommendations based on vehicle usage, warranty requirements and guidelines recommended by the manufacturer. At Lube Mobile, we are all about convenience - servicing your fleet vehicle does not need to be time consuming or difficult - call us today and see just how easy we can make it!